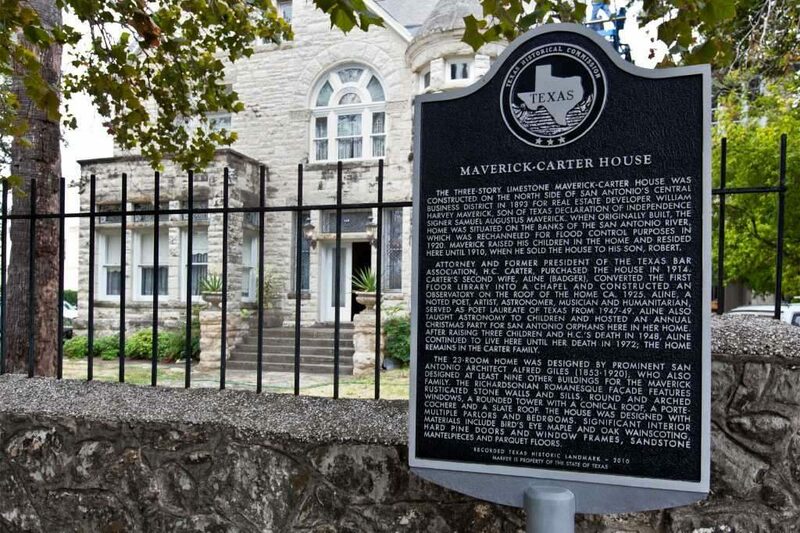 Hidden away in the center of downtown San Antonio, Texas is a 23 room house built in the 19th century originally built for the Maverick family. Later it was sold to the Carters. This location was the home of Aline B. Carter, my mentor, at the age of 12 when I first was exposed to the wonders of astronomy. Aline Carter taught an inspirational course in astronomy at the Witte Museum during the summer of 1959. It was during this brief period that I attended lectures on the universe, the wonders of creation and the principal objects in the sky that were the most prominent. Included were optional night time excursions to her home at 119 Taylor Street which still exists today. The home itself has been preserved as a historical monument as shown in the following image. The historical marker acknowledging the housethat has a unique limestone facade. More importantly was the woman who lived within. In addition to being an accomplished musician, she was also a poet laureate of the state of Texas from 1947-1949, artist, and humanitarian. Her grandmother was the first anglo female settler in Texas. She died at the age of 80 in 1972. The church which she regularly attended was only a few city blocks away from Carter House. 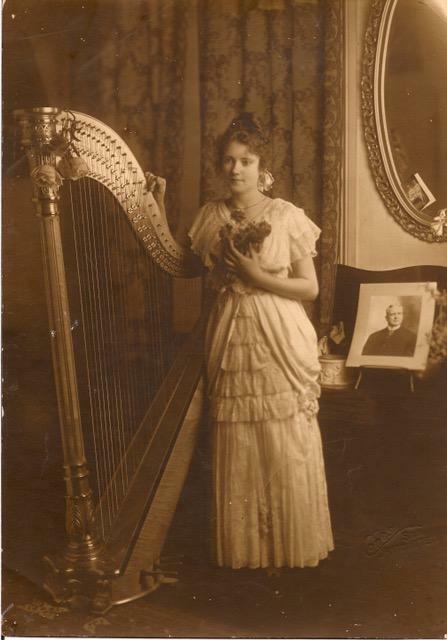 Aline Carter in the 1920’s taken in side Carter House. Perhaps the most important part of the house is the observatory. 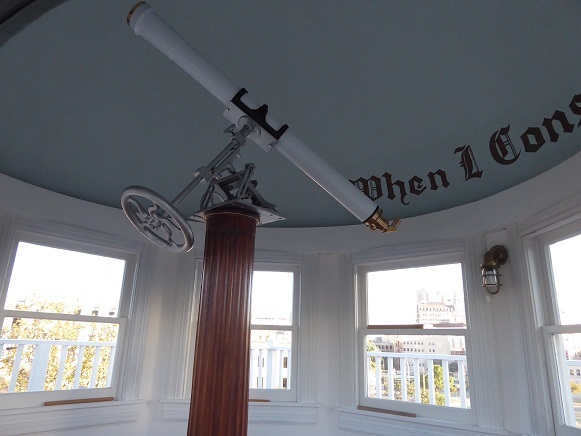 It now houses a restored 4-inch refracting telescope. Though not very powerful, it was sufficient to convey the Sun, Moon, and major planets from the center of downtown San Antonio circa 1960. 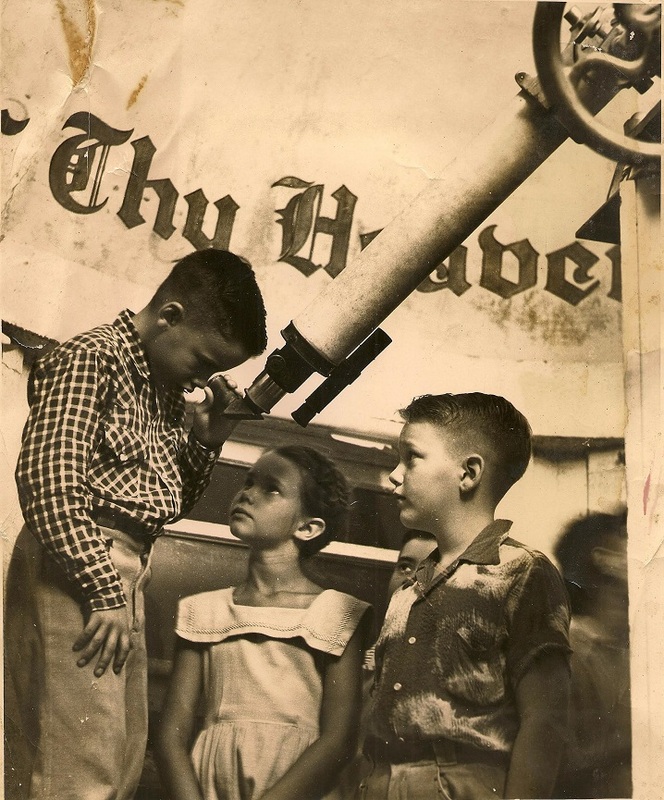 Students observe through the right angle eyepiece of the refractor in the 1950’s. In addition to being an educator, Aline Carter was a fervent advocate of social justice. Her husband H.C. Carter was a local judge. In a famous case, she took it upon herself to support a defense for a known killer. 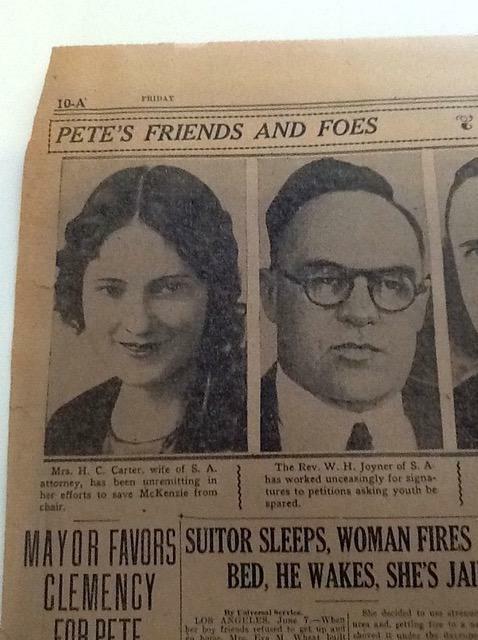 Clipping from the San Antonio Light in 1929 noting Aline Carter’s role in attempting to save Pete McKenzie from execution. 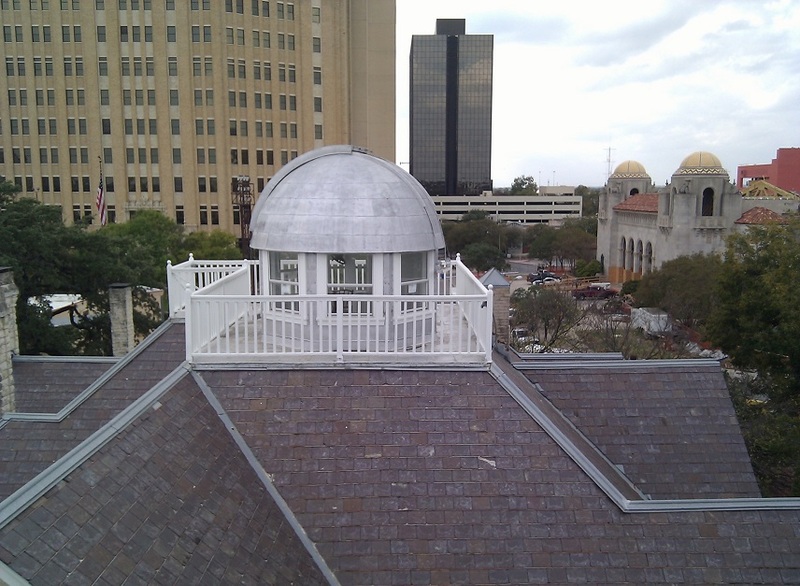 The restored telescope today in the refurbished dome. All photos by P. Maley unless otherwise noted. In November 2017 I was priviliged to create a plaque that honored the late Aline Carter. It was installed following a ceremonial dinner in the Carter House. 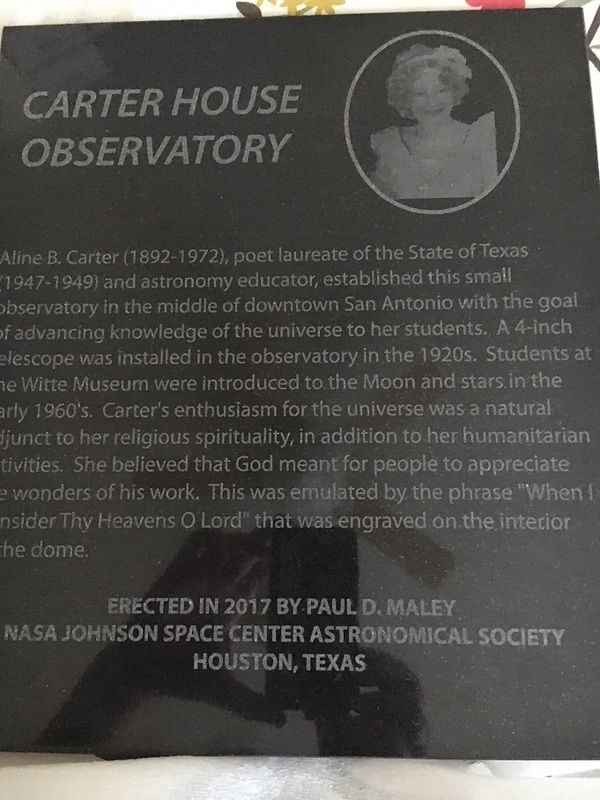 Plaque installed inside the observatory commemorating the life of Aline Carter and the observatory. 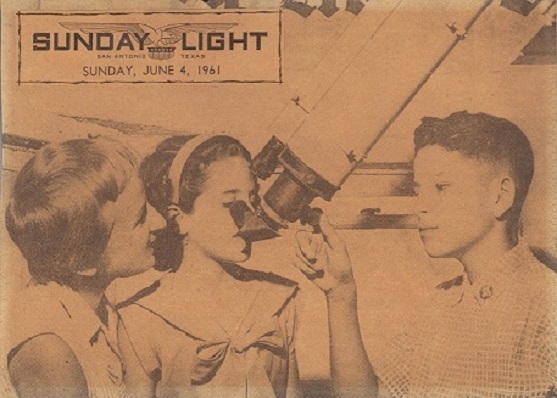 A memory from 1961 when I (right), my mother and sister observed through the telescope. 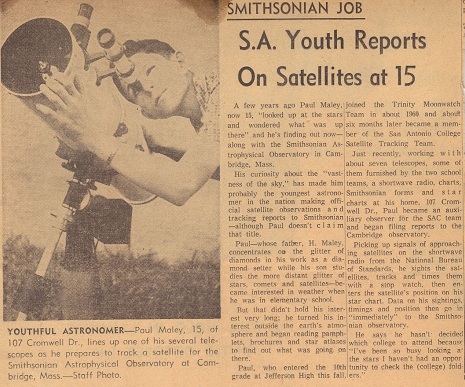 My interests expanded to observing artificial satellites as part of the Trinity University Moonwatch Team as a result of the personal encouragement by Aline Carter. Dome housing the telescope. Various buildings including the Tobin Center surround the house. 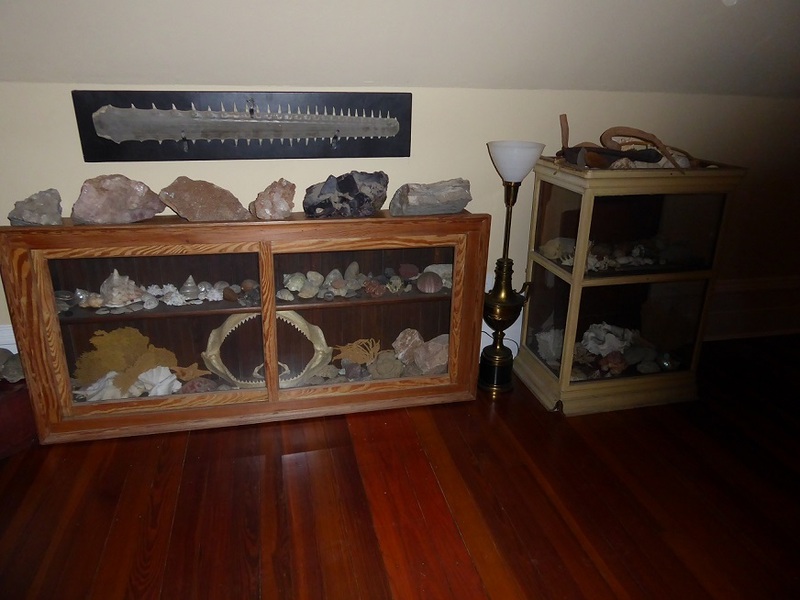 Aline Carter’s collection of fossils, rocks and other things related to nature. 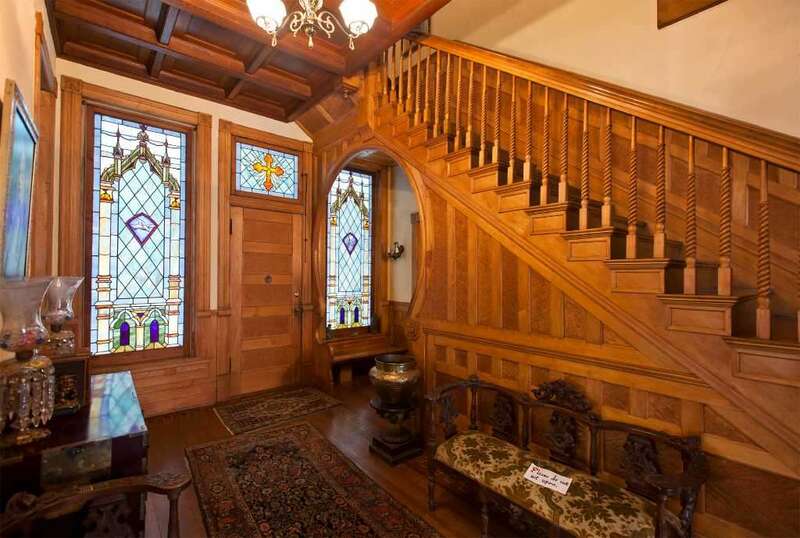 The ornate entry to the house. All furnishings are original. The house was purchased from William Maverick in 1910 who was one of the original signers of the Texas Declaration of Independence. 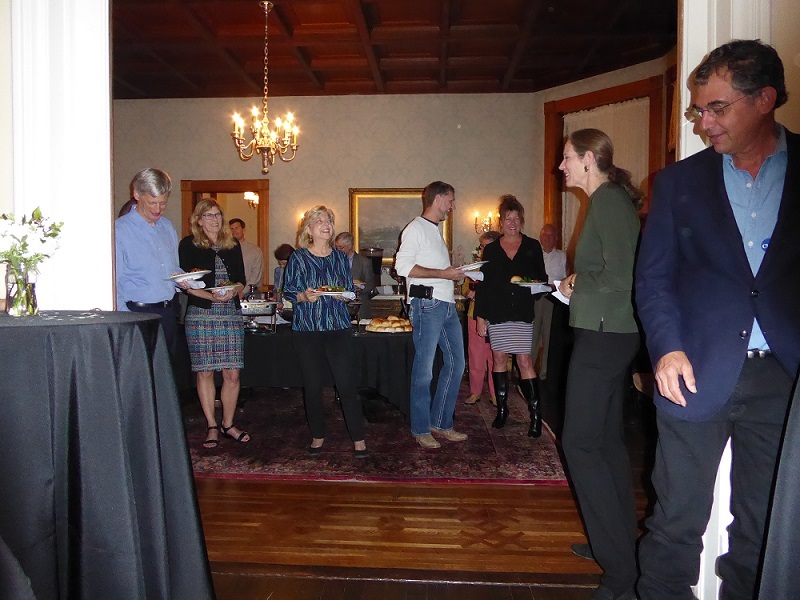 Some of the numerous guests and family at the inaugural dinner.